Heavy rain which sent a 4ft torrent of water through a Cornish village has left a "devastating" scene, a fire chief said. 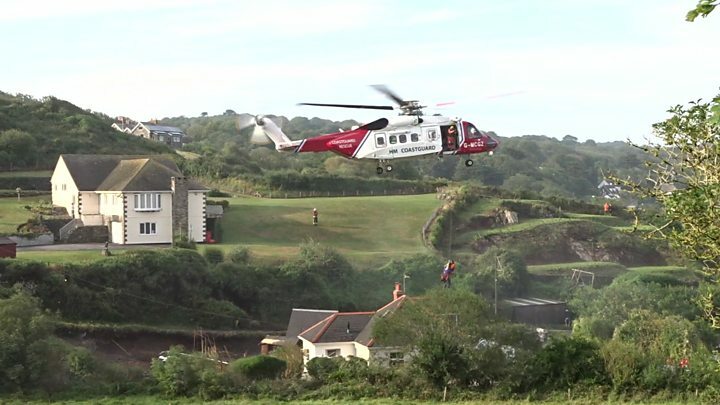 About 50 properties were damaged and several people had to be rescued in Coverack, on the Lizard Peninsula, as storms hit on Tuesday afternoon. Water swept through the village, leaving roads in and out impassable. A school bus remains stranded. People described being hit in the face by marble-sized hailstones. Heavy rainfall hit at about 15:00 BST on Tuesday and about 50 properties are thought to be affected by the flooding, but there were no reports of serious injuries. The Environment Agency said 4in (100mm) of rain fell over two to three hours. Cornwall Fire and Rescue Service said its crews attended "multiple flooding-related incidents" and urged people to avoid the area. Stan Harris had been laying slate in the village when the rain began to fall. "We started to hear the rumble and then suddenly I was hit with marbles, hitting me in the face. I couldn't get out. I was just stuck in a shed," he said. He said he thought his was the last vehicle to make it out of the village. "By the time we got up past the lady we were working for, she said we were probably one of the last ones to get through because then another van floated through. "By the time we got home it was chaos. Absolute chaos." Assistant Chief Fire officer Phil Martin said there was now a "pile of rubble" about "3ft or 4ft high, that goes across about 20ft". 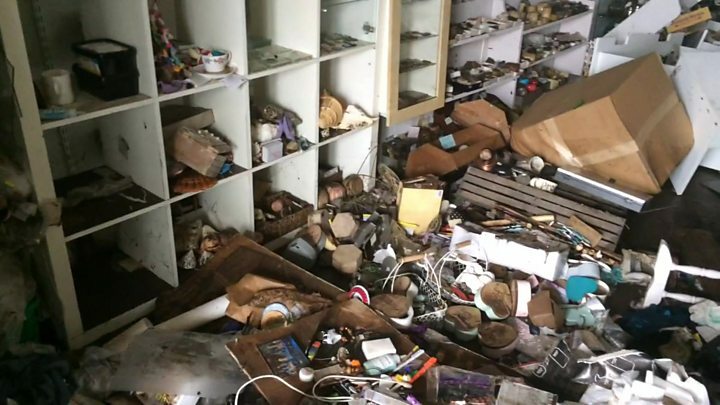 "You can see rubble on the beach and debris that's been washed down by the water," he added. He described the flash flood as "devastating", adding "when I was listening to this incident unfold on the radio I had a real fear that this was going to have a tragic outcome ". 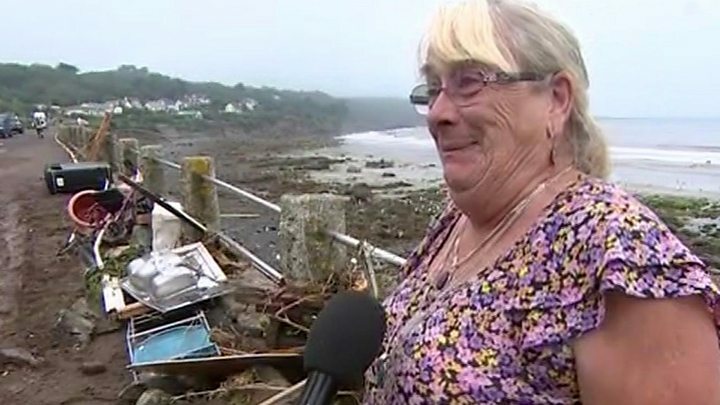 So far, the main focus has been Coverack's pretty harbour, which is littered with debris of every kind. I've seen boulders, fence panels, a shed, a mobility scooter and even a kitchen sink, which have all been washed down from the hills above in the torrents of water. The mud and silt are unpleasant - but that damage is mainly cosmetic. The more worrying aspect of all this for local people is the main road into the village. A route which normally brings in thousands of tourists every day during the summer months is a total mess. The Tarmac has been ripped up. There are holes several feet deep, exposing pipes and cables. Repairing this road looks like a major engineering task. "But we're Cornish," said one local lady. "We'll cope". A school bus driver caught up in the Coverack flood said he was determined to make sure his sole passenger got home safely after they became stranded on the road into the village. "The boulders from people's gardens were pummelling the bus," said Thomas Duffield, 33. "They were about the size of a wheel and kept whacking the vehicle, making loud bangs, which was obviously quite worrying." He kept his foot on the brake pedal even though he had the handbrake on while he waited for help. He said: "I felt a little bit uneasy about taking my foot off the pedal, because it was like we were in the water rapids." 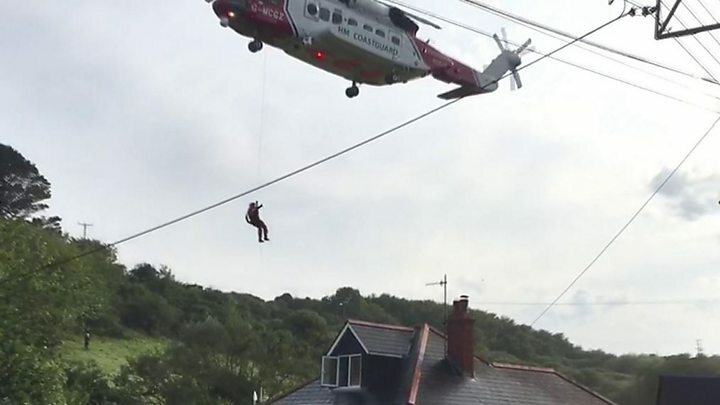 The Maritime and Coastguard Agency sent a helicopter from Newquay which rescued two people from a house. Adam Paynter, Cornwall Council leader, said he hoped the authority's reserves would cover the cost of the clean-up. "I think it's going to take a little while to get this sorted out and tidied up but obviously the main thing is that nobody's been injured and everybody is OK in the village. At a meeting for local residents earlier Cornwall Councillor Geoff Brown said the authority's main concern was the care home in the village, which has lost power on the ground floor. He added that a generator was on the way. His pledge to ensure the damaged road was repaired quickly, and would take "weeks rather than months", was met with loud applause. A major incident was declared at 17:20 on Tuesday and the helicopter was deployed to rescue the people trapped on the roof. Ben Johnston from the Environment Agency said the flood had caused some watercourses to become polluted but drinking water was safe. Have you been affected by the flash flood? If it is safe to do so, you can share your experience by emailing haveyoursay@bbc.co.uk.